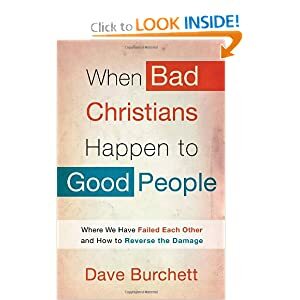 When Bad Christians Happen to Good People: Where We Have Failed Each Other and How to Reverse the Damage by Dave Burchett. Dave really makes you think a lot in this book about our actions as so called Christians. As a Christian society we have hurt many people. I know I have and my daughter have. The things that we can do in the name of Christ can be appalling. I would highly recommend any Christian to read this book and live out the action steps. I am not that crazy about Dave’s writing style. He uses a ton of one liners that don’t always benefit in clarifying his statements. But the content overall is really good. I received this book from the publisher to do an honest review.